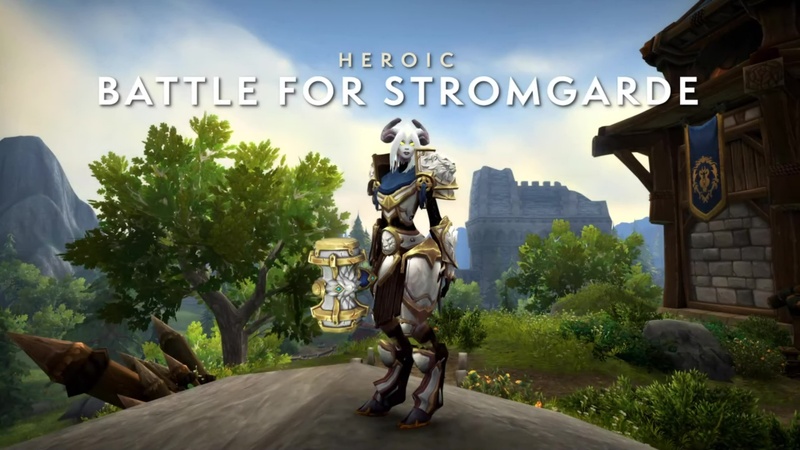 Moving right along, we will be introducing our very first Heroic Warfront starting with Battle for Stromgarde. So when we are approaching Heroic Warfronts, one of the things that we want to make sure it felt like is not simply a 20-minute long boss fight. There should be a dramatic difference between a Heroic Warfront and doing a raid boss. So one of the things we have been having to focus on is the strategic layer of Heroic Warfronts. If you play StarCraft II or Warcraft III, you may remember missions when the enemy started sending huge waves of very different units to different locations, and having to divert your forces; and in some cases, hole up inside of your city, and defend in order to take the fight back to them. We are going to be introducing many of these mechanics into the Battle for Stromgarde. We will see particular attack waves in areas where you are weakest, and you will have to determine amongst your raid who is going to head back and defend, as you risk losing. You will also have to determine how you are going to spend all of your resources in order to best combat they are sending at you; and you may even see the enemy commander periodically take the field, take the fight to one of your locations, only to teleport out with their group once they are at a certain percentage of health. We are really excited to see what you think about this. We feel like it plays dramatically different than any of our raid boss fights.